Microsoft has shaved a sizable $75 off the official price of its Band 2 smartwatch. Recently, Redmond has been selling the device for $249.99 over at the Microsoft Store, but until October 16, it will remain available at a cut-price $174.99. Successor to 2014's original model, the Microsoft Band 2 has been floating around for the best part of a year now. The sort-of-fitness-tracker-sort-of-smartwatch does have its faults, including a not-so-great battery life and arguably high price. But the market for wrist-worn gadgetry is still an emerging one, and the Microsoft Band 2 does quite a few things well. As noted in our review, it packs a bright, responsive display along with a generally pleasing, Windows-based UX. A fitness-focused wearable that's also easy on the eye, the device is packed to the gills with sensors including GPS, and is well supported by the Microsoft Health app. Compatibility is also on point — users can pair the Microsoft Band 2 up with any handset running on Android, iOS or the company's own Windows platform. If you're looking for the medium or small versions of the Band 2, you might want to head over to Amazon, which has the pair at an even cheaper price point than Microsoft's newly lowered offer. Either way, both the Microsoft Store and Amazon links can be found just below the gallery. The worst thing about the Microsoft Band 2 is Landscape only display, why no Portrait option, hated turning head just to see the time. 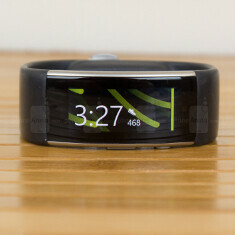 Roll on Microsoft Band 3 Announcement & hopefully better software & portrait mode & much better Android phone notifications, hopefully it wont be too long maybe sometime this month?